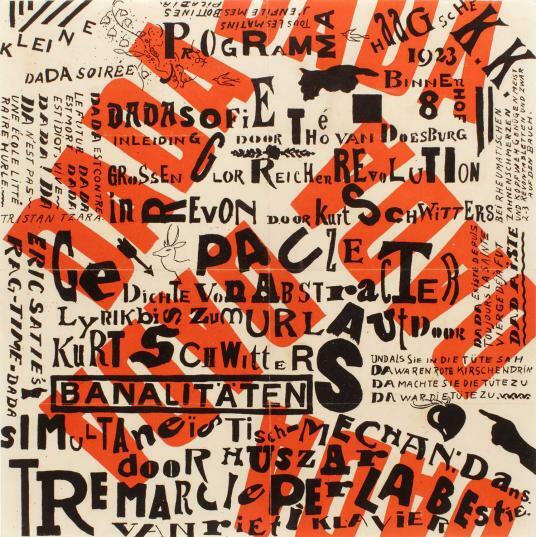 Kurt Schwitters and Theo van Doesburg, Poster for Kleine Dada Soirée, 1922–23. Lithograph. Merrill C. Berman Collection. A fascination with language connects Dada artist Kurt Schwitters’s art and poetry with his little-known graphic design practice. Schwitters was an outspoken advocate of the New Typography and founder of the Ring of New Advertising Designers, a group convened to promote modernist design. This seminar, led by Robert Wiesenberger, the 2014–16 Stefan Engelhorn Curatorial Fellow in the Busch-Reisinger Museum, will examine drawings, prints, and posters by the Ring’s founding members, including Schwitters, Max Burchartz, Walter Dexel, Jan Tschichold, and Piet Zwart. The seminar is presented in conjunction with an installation of works on loan from the Merrill C. Berman Collection in the Busch-Reisinger Museum’s galleries. Free admission, but capacity is limited to 15 and registration is recommended. To register, please email am_visitorservices@harvard.edu. Please arrive 15 minutes before the start of the program to allow sufficient time to sign in at the Art Study Center reception desk. Note that there is a wait list for this program; spots unclaimed by 11am will be released to those on the wait list. Please be prepared to present a photo ID.